The NHL 2018-19 season is here and the Pittsburgh Penguins will be chasing their third consecutive Stanley Cup. If the Penguins manage it, they will become the first team since the New York Islanders (1980-83) to win three Stanley Cup Championships in a row. Key players Evgeni Malkin and Sidney Crosby led the Penguins to 2015–16 and 2016–17 Stanley Cup titles and with their exceptional talents, they are ready to give the opposition a tough time. The Penguins are back and have their sights set high for this upcoming season. Led by a high octane offense, Pittsburgh is aiming to bring home another Stanley Cup trophy. Division rivals, the Philadelphia Flyers and the New York Rangers will look to spoil their aspirations. Grab your Pittsburgh Penguins tickets and head down to the Consol Energy Center and help bring home another championship! Representing the Metropolitan Division of NHL’s Eastern Conference, the Pittsburgh Penguins played their first season in 1967. Since their inaugural year till 2010, the team had been playing its home games at the Civic Arena in Pittsburgh, Pennsylvania. Due to its shape and design, the Civic Arena came to be known as the Igloo and as its tenants the franchise came to be known as the Penguins. It has been a rollercoaster ride for the Penguins as they have enjoyed some incredible seasons, along with a few disappointing ones. With five Stanley Cups to their name, they remain one of the most successful teams in the NHL. First Ever Stanley Cup Title – It was the 1990-91 season and after an exciting playoff run, the Pittsburgh Penguins defeated the Minnesota North Stars 8-0 to lift their first Stanley Cup. The anticipation was off the charts for Game 1 and the Penguins gave the excited crowd at the Civic Arena plenty to cheer about. After years of waiting, the city of Pittsburgh finally tasted hockey glory. 1992 & 2009 Titles – After winning their first championship, the Penguins returned even stronger the next year. They defeated the Chicago Blackhawks 4-0 to clinch their second consecutive Stanley Cup title. The 2009 Stanley Cup brought another triumph for the Pittsburgh Penguins as they defeated the defending champions Detroit Red Wings. They sealed their victory 4-3, becoming the first team to win Game 7 on the road. Penguins Claim Fourth Title – Sidney Crosby, Evgeni Malkin, Kris Letang and Phil Kessel led the side to a convincing 4-2 victory over the San Jose Sharks. The Penguins dominated the finals with improbable saves, double, triple OT goals and fierce body language. The team once again won the game on the road as Game six was held at the SAP Center in San Jose, California. 2017 Stanley Cup Champs –4-2 victory over the Nashville Predators earned the Penguins their second consecutive and overall fifth Stanley Cup title. Held at the Bridgestone Arena in Nashville, Tennessee, Game six determined the Penguins as the winners. It was an exciting series as both teams played some solid hockey and the fans got to enjoy nail-biting action. For the Penguins it has been a stellar run to become the first back-to-back championships in the NHL’s salary cap history. The Penguins share what is considered to be the best rivalry in the NHL with the Philadelphia Flyers. What drives this rivalry is the passionate fan base from both sides. The Penguins and the Flyers fans are intense supporters and whenever the two teams face off, the crowd is equally involved. On the ice rink, the Flyers and the Pens are known for their physical playing style. Their faceoff brings a myriad of emotions – fierce competiveness, respect and even hatred. The Pittsburgh-Philadelphia rivalry began in 1967 when both became a part of the Next Six expansion. Philadelphia Spectrum hosted their first game and the Flyers won it 1-0. Since then they have played each other 281 times and the Flyers lead with 153-90 win–loss record. From Mario Lemieux to Sidney Crosby, the Pittsburgh Penguins have found immense success on the shoulders of its talented players. Perhaps the most notable player to wear the Penguins’ Gold and Black jersey is Lemieux. Nicknamed Super Mario, he led the Penguins to back to back Stanley Cup wins in 1991 and 1992. Mario was lent full support by the goaltender Tom Barrasso who was a part of the Stanley Cup winning roster. Following a first draft pick in 2005, Sidney Crosby landed in Pittsburgh and along with Evgeni Malkin and goalie Marc-Andre Fleury became the nucleus of the team for the next decade. All three have played an instrumental role in helping the Pittsburgh Penguins lift three Stanley Cup trophies. After 43 years in “The Igloo”, the Pittsburgh Penguins moved to the PPG Paints Arena (Formerly Consol Energy Center) in 2010. With one of the loudest, savviest hockey crowds in the league and cutting edge arena technology, a Penguins game is one of the best sporting events on the planet. Also, there’s no such thing as an unimportant hockey game in Pittsburgh. With a fanbase like this and an owner like Mario Lemieux, ever game counts. The curtain has been lifted on the 2018-19 NHL season and team Pittsburgh is once again the favorites to win the Championship. To be a part of the team’s journey, fans are eagerly waiting for Pittsburgh Penguins Playoff tickets. Standing in their way are the Nashville Predators, Washington Capitals and the Chicago Blackhawks, promising thrilling ice hockey action. So get your cheap Penguins tickets here today! Our process for purchasing cheap Pittsburgh Penguins tickets is simple and fast. There are so many online ticketing sites, that it can be hard for customers to find the right place to buy Pittsburgh Penguins tickets at the cheapest price. At ScoreBig we think of our customers first and foremost. We offer daily deals for Pittsburgh Penguins events, so our customers can get the best seats for the best prices. ScoreBig will always go above and beyond to offer the cheapest Pittsburgh Penguins tickets on the market. The Pittsburgh Penguins schedule above, displays all available events for 2019 and 2020. Once you find the event that you would like to go to, click the red “Get Tickets” button. It is located on the right-hand side of the event listing, it will take you to an Pittsburgh Penguins event ticket page. ScoreBig's event ticket page will display all available Pittsburgh Penguins tickets for that event. On the event ticket page to help with your search for the right Pittsburgh Penguins tickets, use the filters at the top to select quantity, price range, and more. There is also an interactive seating chart so you can pick where you want to sit. When you are ready to buy a ticket, click on the listing, and you will be directed to ScoreBig's checkout page. Upon completion of the information fields, your order will be processed and your Pittsburgh Penguins tickets will be delivered via email, mail, or to your mobile device. What makes ScoreBig’s site stand out from the rest? We are constantly analyzing our competitors to improve our site, service, and prices. ScoreBig.com employees strive to offer the best process and experience to buy cheap Pittsburgh Penguins tickets. Our goal is to get you the best seats to Pittsburgh Penguins events. We offer daily discounts on our site and for special promotions check out our newsletter. If there are no Pittsburgh Penguins events currently available, you can use our search feature at the top of the page to see a list of all popular events going on near you. No matter your price point, we have all the best deals and discounts on Pittsburgh Penguins tickets. For more information on prices of Pittsburgh Penguins tickets and the schedule for Pittsburgh Penguins, check out our listings above. The last thing you want to find out is when the Pittsburgh Penguins event you wanted to go to is sold-out. Don’t worry in many cases ScoreBig has affordable tickets to sold out events. We sell tickets from GA all the way to premium seating and parking. Skip the scalpers in the parking lot and get your tickets online from top Pittsburgh Penguins ticket brokers. We get you in all events, buy your Pittsburgh Penguins tickets here from a brand that many trust and rely on for all their ticketing needs. ScoreBig offers a 100% money-back guarantee. If you have been in search of cheap tickets for Pittsburgh Penguins, ScoreBig by far is the best option. That’s why ScoreBig has more loyal customers than any other ticketing site. 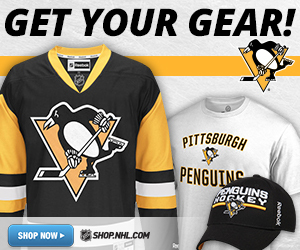 Shop at ScoreBig for safe and secure Pittsburgh Penguins event tickets.